... I seem to remember Richelieu's max fuel capacity was ~ 6000 tons, but wartime load was 4500 tons... Do we know if the 7500miles figure is given for 6000 tons or for 4500 tons of fuel load ? Because, if it's for 6000tons, the corresponding range at 4500 tons is about 5600miles. according to Jordan-Dumas, Richelieu had a max fuel capacity of 5866 tons (peacetime cruising), reduced to 4500 tons in wartime in order to maximize the underwater protection effectiveness. The range @ 20 knots was 8250 miles with her max fuel load. Therefore the range of 7500 miles looks a bit an average figure with a fuel load far exceeding the cautionary wartime one but still less than the max possible (a kind of operative "deep load"). However, also Littorio's had a max fuel capacity of 4100 tons (of which only 4000 were usable), for a range of 4100 miles, while the normal load was 3700 tons, and the wartime load (in 1941) was 3300 tons only, for a range of just 3380 miles @20 knots. It's quite delicate to compare these data, but I think that the lower Littorio's capacity and their worse evaporating system efficiency is quite evident. I would assume a fuel "deep load" in wartime of around 5000 tons for Richelieu and around 3800 tons for Littorio's, with a range of 7000 miles for Richelieu and 4000 miles for Littorio's. What about the the AAA and anti-destroyer capabilities of these battleships? if you compare Richelieu AAA with Littorio's as built, I would say both of them were not outstanding and had no radar. Richelieu initial design was for a dual-purpose battery of 150mm, but the triple turrets proved to be too slow to follow an aircraft and the shell too heavy to be loaded at high angles. Therefore 2 triple 150 turrets were removed from the design and the (quite good) 100 mm's were installed instead, thus reverting basically to a single-purpose concept. Littorio's had a very sophisticated and modern 90 mm AA gun in single turrets, totally stabilized, but they were too complex and failed often, while the caliber was really a bit too small for high altitude bombers. The light AA guns of both ships had problems and did not prove to be very good, especially the French 37 mm and 13,2 mm were obsolete. My preference is for the Littorio's, but Richelieu was not really completed and improvements may have come shortly after. A completely different story if we consider Richelieu after the US and Britain refits, with the huge number of 40 mm Bofors installed and the radars. In this configuration, Richelieu was far better than Littorio's regarding AAA and possibly better than any non-US ship against low altitude planes. I do consider Littorio's well equipped against destroyers: the 150mm was considered the best Italian gun of WWII in terms of dispersion (very limited) and power. I don't know much about Richelieu 150 mm but the fact that they were installed all aft, gives me the impression that the ships could have been "exposed" to an attack coming form the bow direction, due to a quite important blind angle fore. Both ships had no radar to be used against destroyers, at least before Richelieu refit and Littorio's first radar in 1943. Forgive my ignorance in this, but what is a delay coil and what does it do? the delay coils were devices used to delay the fire trigger impulse for some guns vs the others and thus to diminish the interference between too close guns when fired together during the same salvo. I think to remember that on "Scharnhorst"'s triple turrets (whose guns were fired usually within the same salvo) the central gun fired first, followed (within 10 to 20 milliseconds delay) by the lateral ones. I don't know whether delay coils were implemented on Bismarck's too. Delay coils were integral part of the Seitenvorzündwerk. But ist primary function is somwhat different from the "Delay coils" in foreign ships. German turrets were automatically fired by the Seitenvorzündwerk during rotation of the turret on a predefinied position set by the firecontrol computer. (the same firing procedure as used today by modern main battle tanks). the timing of the "...vor"zündwerk could be set individually for each gun. thanks Thorsten, clear as per "Seitenvorzündwerk" mechanism (that you had posted on this forum). Do you consider that in case of stable platform, the delay coils were still firing the center gun before the others to avoid interference or do you consider that in this (ideal) case the guns were fired perfectly at the same time ? Interesting, I had taken the figure of 91 shells fired from Bagnasco's The Littorio Class, for a total of 102 shells ordered to fire in 29 salvoes (Meanwhile, Vincent O'Hara in The Struggle for the Middle Sea, which describes 92 shells fired with 11 misfires, but this obviously incorrect). The conditions at the battle were not the best for shooting, which I do agree hampered Vittorio Veneto's gunnery, but at the same I tend to not consider it to be a large part of why she failed to hit - the RM Type 4 was an excellent fire control system, and even if it was only relying on optical inputs it still proved very accurate in spite of this - four months before she had very accurately targeted the cruiser Manchester at very long range and although only firing 7 salvoes managed to straddle early on. Bagnasco gives the range as 28500 to 32500 meters, although O'Hara quotes Campioni as stating he opened fire at a range of 32,000 yards (29260 meters) and ceased fire at 40,000 yards (36576 meters). In VV"s gunnery action of Operation Gaudo, she opened fire at Orion at a range of 23000 meters, and her first salvo was an over - Bagnasco describes it as a broadside (English-language text reads as: "By way of response, at 10.57 Vittorio Veneto opened fire on Orion which was the leading British ship, with all her main gun turrets, at a range estimated at 23,000 metres. "), but O'Hara describes it as a 6-gun salvo. Despite this, she is described as quickly finding the range, and Orion received 10 accurate salvoes before VV ceased fire for 3 minutes (because of the misfires in turret No.1). Fire was resumed against the Gloucester, exposed by the smoke screen, who maneuvered violently as destroyers moved to covered her with smoke, and again VV frequently straddled her. However, with incoming aircraft, and being unable to accurately continue to spot the fall of her shot, VV was forced to cease fire at 25000 meters. By all accounts, it seems that in spite of the weather conditions, smokescreens, and maneuvers of the British cruisers, she was extremely accurate in her targeting of the cruisers - but what help her back from hitting was the dispersion of her shells. You're right in that it's not very comparable - whereas Richelieu's dispersion issues lie entirely in the fact that the barrels in each half-turret are too close, the problems affecting the Littorio-class had little to do with this, and while delay coils would've likely helped in combating dispersion, it would only be marginal - as you said, the issue had more to do with quality control. The exercises later in the war don't seem to show great dispersion being a problem again, nor does Littorio's guns in action (while Iachino had many complaints after 2nd Sirte, dispersion of the 381mm guns was not among them, at least as far as Bagnasco reports). Overall, I do agree that the guns of the Littorio-class were overall more accurate and harder-hitting than those of Richelieu. The Littorio's as a whole I think were good ships, and although some shortcomings are certainly due to design (for example, diesel generators being outside of the citadel, and the considerably thinner deck armor over the machinery spaces), I think many of their biggest problems were things shared by the Regia Marina as a whole. Lack of range was common with many ships (because, as you said, Mediterranean usage), but also the lack of radar until so late in the war was of considerable disadvantage, and perhaps more than anything else the lack of cooperation between the Air Force and the Navy - time and time again the admirals at sea were let down by the inability of the Regia Aeronautica (or the Luftwaffe counterparts, especially in regards to their willingness to cooperate) to give effective reconnaissance, or effective air cover, to the fleet. If Iachino never mentioned delay coils, I think that means its more likely than not they were never installed. I've never had a chance to read any of Iachino's books, so I'm curious - what did the corrective measures entail, at least in regards to dispersion of the guns? I know there was some re-shuffling of powder, and more strict quality control put in place, but any details on that, or other measures? And does he place the blame on quality of shells, or propellant charges? Indeed, that table is one of the references I've been using. Given the basis of Italian gunnery was on turret salvoes, I think it's safe to assume all recorded figures are for 3-gun turret salvoes. I do wish more information was provided in regards to number of rounds/salvoes fired, and what the conditions of the target was (as hit rates are listed). The pattern from the figures is somewhat difficult to use due to how wild Vittorio Veneto's figures are. Whereas Littorio's dispersion remains largely consistent, having seen 315m at 17.4 km, but about 360m at 18.8 to 22.5 km, VV's is all over the place - the longest-ranged figure (21 km) is the most accurate at 267m, but closer to Littorio's figures for another exercise (slightly greater dispersion at slightly greater range than her sister's 17.4 km shoot) - and then the 'median' range of VV's shoots, 20 km, sees a massive jump over any other figure. It should be noted that both battleships experience increased dispersion from previous years going into 1941, but VV's increase is a far more drastic doubling of the spread. Coupling this with her far greater dispersion in the Battle off Gavdos compared to Cape Spartivento, it seems she took on her infamous ammunition load in-between these points - as the values for the 1941 shoot, and Operation Gaudo, are all outliers compared to other figures (the only ones in excess of 2% of the range). I think you may be confusing the numbers I described for Richelieu. The 270-meter figure was for a single gun, the same gun firing 8 rounds and then measuring the dispersion - not two guns from different turrets or half-turrets. The 450-meter figure is of a single half-turret, so only two guns firing, both being of the same half-turret (as shown in the image above). The use of a single gun was only for the purposes of a test, as standard firing procedure used half-turret salvoes. Re-reading some sections of the Jordan/Dumas book, it seems four-gun salvoes were not full turret salvoes, but rather the firing of two half-turrets from different turrets. So, with the exception of VV's poor shooting in early 1941, who's turret salvoes were worse than the dispersion experienced by the half-turret salvoes of the 380mm Mle 1935, in general the 3-gun salvoes of the 381/50 M1934 seems to have been the tighter spreads. As far as your description of Italian Fire Control Procedure, that's the same as I understand. As far as I know there was never consideration for full broadsides, as fire was only done in 3-gun or 6-gun salvoes - most likely the fire-for-effect phase would've involved the British-style 'fire as soon as she loads' style. The note that both ships had velocity reduced is an interesting one, but it should be noted they were for different reasons. The lower of velocity on Italian guns was directed towards reducing dispersion and barrel wear (which also reduces dispersion over time). For the French 380mm guns, this had more to do with shell design and availability of charges. The initial combination of OPfK Mle 1935 shells and SD21 charges resulted in the detonation of shells in the barrel because of the gas cavities in the back of the APC, so thus the SD19 shells of the Dunkerque-class's 330mm guns had to be used, which caused the drop in velocity (from 830mps to about 785 mps). When the United States made shells and charges for the French, these were loaded, and the new OPfK Mle 1943, when used with the American charges, had velocity of 800mps. However, as it turned out, the American charges were not very compatible with the French replenishment system, which lead to bags being frequently breaking - which would shut down the turret for the half-hour required to sweep it clean. As a result, Richelieu continued to rely on the SD19 charges more often than not (three quarters of her charges were SD19), and in the event of combat against enemy ships, the crew kept an emergency stash of the original SD21 charges she was meant to operate with! Her muzzle velocity, ultimately, ended up being variable as a result of the three different charges kept on the ship. In regards to armor protection - in my personal opinion I think that Littorio was the better protected of the two, especially against each other's guns, and I dislike the practice of putting so many eggs in the same basket (all main guns being in just two turrets) - but to give credit where it is very much due, the deck protection of the French battleship was very good. 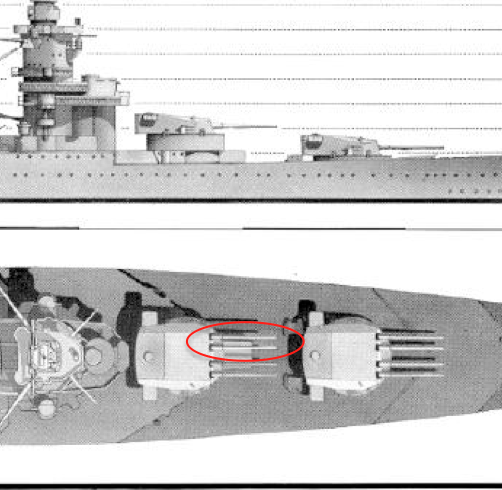 While Littorio's magazines were very well protected (effectively 42mm upper deck/70mm hull side to decap shells before hitting a laminated deck of 157mm effective thickness), the machinery spaces used a 100mm OD plate instead of 150mm as on the magazines, and I suspect would be quite vulnerable to the guns with heavier shells emphasizing deck penetration at long range - such as the American 16"/45 Mk.6. Richelieu has a 150mm deck over her machinery, and a 40mm splinter deck below that to defend against any resulting splinters, which is likely much more resistant (although still penetrated by the 16" Mk.6 in combat at Casablanca). That being said, against the modern 380/381mm guns of the European battleships, either battleship has plenty enough deck protection, as all of those guns tended to not perform particularly well against deck armor. you wrote: "not only do most accounts of the action only describe Orion and Gloucester being targeted, but the image's caption also describes the salvo as being an over of Orion rather than being aimed at Perth"
I know that, but the British cruisers were (at that stage of the battle) on a front line (roughly) and Orion should have been on the starboard side of Perth (possibly the smoke we see on the extreme left side of the photo). Thus, if this picture shows a salvo aimed at Orion, it should have been a short and not an over. The VV GAR doesn't specify which ship was targeted at what time, but it says that VV had to switch target several times (not only once) during the action, due to the maneuvers and the British smoke, thus it is IMHO more probable that the salvo is actually aimed at Perth, wrong for line (a bit too much on the right, as British ships were zig-zagging at each VV salvo) and good but dispersed for range. We will possibly never know, as British may not have registered it as aimed at Perth if VV, immediately after, changed her target to Gloucester. you wrote: "the machinery spaces used a 100mm OD plate instead of 150mm as on the magazines"
you wrote: " I've never had a chance to read any of Iachino's books, so I'm curious - what did the corrective measures entail, at least in regards to dispersion of the guns?" I don't think any of Iachino's books have been translated in English, unfortunately as it was not also the "ultimate" Mattesini book ("L'operazione Gaudo e lo scontro notturno di Capo Matapan", USMM, Ufficio Storico Marina Militare, 740 pages covering all aspects and including several original documents) in which the VV GAR data have been used (included in the final fleet command operation report, mentioning the 94 shells in 29 salvos and speaking of a first opening salvo of the 2 fore turrets only) and the corrective actions have been mentioned as well. Iachino mentions the corrective actions as a whole (not only dispersion) in two book: "Gaudo e Matapan", 1946 and in "Il punto su Matapan", 1969 (out of the three ddicated to Matapan and the preface to the Italian version of Pack's book). The only corrective action he suggested by Iachino to Riccardi (Capo di Stato Maggiore = First Sea Lord) and Mussolini (the "Duce" wanted to meet him immediately after the disaster...) re.dispersion was the improvement of the quality controls vs. ammunition provider firms. 3) Night fighting training start on all large warships for main guns (not foreseen up to then) (partially successful as gap with British was big and anyway the secondary guns fire directors had to be used to provide data to fire control, as main directors had no suitable night optics installed). Contrarily to what is usually accounted, and despite reciprocal accusations between Rome and Berlin, the cooperation with the Regia Aeronautica (Air force) and German Luftwaffe was not so bad during the operation (see Mattesini book), but it was simply impossible to provide a constant air cover to the fleet so far from the airfields. What was very bad was the interpretation of Italians and Germans pilots sightings done by Supermarina (Admiralty) in Rome, that did not keep Iachino well/clearly informed of the proximity of the British battlefleet. Mussolini approved all these above suggestions (including the quality control amelioration re. ammunition, of course, that was quite successful, at least looking at the results of following gunnery trials) but added a (very heavy) limitation for the RM: "Prohibition to plan any action at more than 100 miles from the Italian land airfields of Regia Aeronautica, waiting for the carriers to be ready". This order, issued officially on March 31 1941, and never officially removed, affected negatively the whole war for the RM, especially during Crete evacuation. Indeed, that table is one of the references I've been using. Given the basis of Italian gunnery was on turret salvoes, I think it's safe to assume all recorded figures are for 3-gun turret salvoes. I do wish more information was provided in regards to number of rounds/salvoes fired, and what the conditions of the target was (as hit rates are listed). The pattern from the figures is somewhat difficult to use due to how wild Vittorio Veneto's figures are. Bagnasco comments, that "[gunnery practice results] suffered a rapid and progressive increase as the range to the target rose (for example: nearly 400meters at 22-24.000meters)". But the table does not include gunnery results for firings over 22000meters - therefore the 22.000 to 24000 meters commentary must come from analysis of other data, not included in the table of Annex no 3. We need to compare the available information at correct ranges. Jordan/Dumas give results for Richelieu out to 25km. We do not have data for Littorio firing out to 25km - but presumably the dispersion was very large. I should add to this that Littorio class dispersion problems mainly came from uneven powder cartridges used - the mass of the powder varying from charge to charge, because of issues in the manufacturing process. During some trials, the producer (manufacturer) reportedly prepared good batches of powder charge, in effect producing consistent patterns of salvos. In normal loading of the battleships however, there was no such strict quality control, and various qualities of powder arrived on board. This not only produced somewhat different "explosions" inside the guns, thus creating different muzzle velocities - and ranges per gun, but also caused different (uneven) erosion inside the gun barrels, thus causating prolonged troubles for future firings as well. I think you may be confusing the numbers I described for Richelieu. The 270-meter figure was for a single gun, the same gun firing 8 rounds and then measuring the dispersion - not two guns from different turrets or half-turrets. The 450-meter figure is of a single half-turret, so only two guns firing, both being of the same half-turret (as shown in the image above). Those must be some sort of averages for different ranges. It's highly unlikely that dispersion remained the same for 16000 meters as for 25.000 meters firings. Alecsandros wrote: "PS2: Interestingly enough, an online book depicting Jean Bart's sole turret firing against USS Augusta , shows guns being fired from odd and even barrels. I.e., gun1 with gun3 and gun2 with gun4. If this is a correct depiction of the actual firing being executed on NOv 10th, it may explain the better dispersion"
IMHO problems of rate of fire become manifest some time later in the shooting battle. For a few shots fired per gun, it is probable that the shells were already inside the turret, or stored immediately below it. Same for powder cartrdiges.